What might, on the first look, seem to be yet another marketing claim or even a nice way to describe the academic concept of brand personality, now gets a new red-hot quality. The recent strategies of Rupert Murdoch aim to turn the impressive success of MySpace, which is already the second-most visited site on the web (after Yahoo), into an even bigger revenue machine. He put one of his most skilled multimedia managers to the task: Ross Levinson, boss of Murdoch’s News corporation’s overarching online unit: Fox Interactive Media. 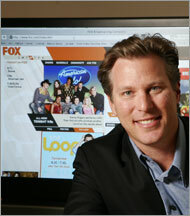 Linked to the FOX TV sales department, he wants to build the way for brands to MySpace. And this is how the friend comes into play: To create friend profiles of products and companies is clearly the goal for this massive cooperation. I read a very interesting NY-Times article on that subject: Making friends was easy. Big profit is tougher. Is that going to work straight away? If we look at labels and musicians and how they use MySpace as the ultimate, most effective music promotion tool, it is thinkable to transfer that mechanism to other products. These products must have a personality though that is attractive enough to make friends with people. It would be an interesting job for a communication agency as well to turn the brand indentity into a net personality, promotable on MySpace. For MySpace, it is a thin line between making profit and selling out their users. The success is not natural and users could turn away from the platform to other services like TagWorld, although creating a friends network takes a lot of work and time. The friends keep the users on MySpace, too many brands could scare them away..